An affordable web-connected printer that’s compact and simple to use. The HP Designjet T120 610mm (24-inch) ePrinter helps you make the most of your office space since it’s the smallest large format printer in its class. It has a colour touchscreen, true print previews and convenient Wi-Fi connectivity. 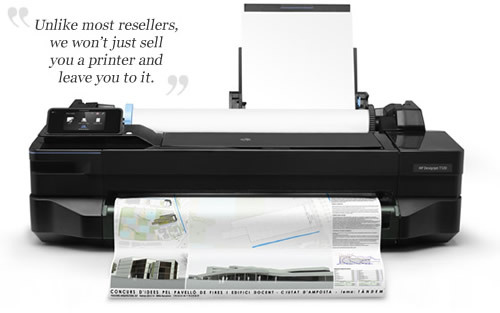 TheHP Designjet T120 ePrinter is the new low cost option that makes large format printing easier and more affordable. You can use your smartphone or tablet to access, view and print from virtually anywhere with HP’s Designjet ePrint & Share. Enjoy the benefits of two printers in one: with a built tray that can take from A4 up-to +/A3 cut sheets and convenient front-loading roll you can produce prints 210mm (8.5-inch) to 610 mm (24-inch) wide. Install your printer where it's most convenient and work where you want, thanks to built-in Wi-Fi connectivity. Save time and money: take control of your print jobs by plotting them in-house. Experience consistent, outstanding print quality and high productivity – Original HP inks deliver rich colours and sharp lines. Up to 24-inch (610-mm) wide. Stand available as an accessory. 70 sec/page on A1/D, 40 A1/D prints per hour. Print resolution up to 1200 dpi. Discover how simple large-format printing can be with this compact, easy-to-use printer. Easily fit this printer where you need it in your workspace – at 987 mm (38.9 inches) wide it’s the smallest in its class. The intuitive, full-colour, 109 mm (4.3 inch) touchscreen enables intuitive operation and simplifies navigation and printing. Complete your work quickly and accurately: accurate print previews are designed to help you print what you need on the first try. Save time and supplies knowing that what you see is what you get. HP Designjet ePrint and Share allows you to print to your HP Designjet ePrinter from your laptop, Apple® or Android™ smartphone or tablet.